So you want some information, and you need it to be more reliable than the average web page. Who do you turn to? You make the effort to track down an authority. Not so fast. It doesn’t always work. Pope Urban VIII, who was learned in the sciences, ratified the statement that The proposition that the Earth is not the centre of the world and immovable but that it moves, and also with a diurnal motion, is equally absurd and false philosophically and theologically considered at least erroneous in faith. George Bush Junior and Tony Blair were quite sure that Iraq was stockpiling weapons of mass destruction. OK, so maybe it’s not the best idea to depend upon political or religious authorities. What kind of authorities can we rely on? All scientists? Would you rely on scientists employed by a drug company, if you’re seeking information about that company’s drug? No? How about government scientists then? That wouldn’t have helped if you had wanted to know about a possible connection between BSE and CJD in the 1990s. New Statesman suggests that the “independent” scientists contracted by the Ministry of Agriculture, Fisheries and Food were anything but. And Dr Harash Narang, the BSE/CJD whistleblower, was stripped of his authority as a result of his persistent warnings about BSE’s linkage to CJD. What about a scientist of Einstein’s calibre? Sure, he got the theory of relativity right, but he was too quick to dismiss Alexander Friedman’s “expanding universe” solution to his (Einstein’s) equations, and also to dismiss Lemaitre’s early insights towards what would become Hubble’s Law. So what can you do, as a researcher, if you can’t depend on authority? In a slow-moving field, you can look for a developed consensus. The Wikipedia “talk” pages can help you to discover whether consensus has formed or not. In a quick-moving field, you can examine the evidence and draw your own conclusions – but that’s not easy unless you’re a specialist in the field. It can help to use sites such as zFacts which attempt to distill the salient facts about controversial issues. Sometimes it’s worth checking out the “debunking” sites. Uncomfortable though it may seem, sometimes it’s easier to establish the validity of a debunking than the validity of the original postulate. Snopes.com is often worth checking out. It’s not intellectual but it often has its finger “on the pulse”. 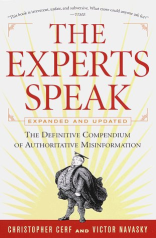 Whether you have faith in what is said by authority figures, or whether you know that they can be as fallible and misguided as the rest of us, you may enjoy Christopher Cerf’s book The Experts Speak: The Definitive Compendium of Authoritative Misinformation. It’s by no means the only book in this nook though. There’s also 776 Stupidest Things Ever Said and Facts and fallacies: A book of definitive mistakes and misguided predictions. This book is a rather dry description of good research into the forecasting abilities of people who are regarded as political experts. It is unusually fair and unbiased. His most important finding about what distinguishes the worst from the not-so-bad is that those on the hedgehog end of Isaiah Berlin’s spectrum (who derive predictions from a single grand vision) are wrong more often than those near the fox end (who use many different ideas). Now that’s really interesting because it gives us a heuristic which we can use to help judge what we read: Has a fact been derived from a single grand vision, or from many different ideas? In a future Web Owls post I will explore other heuristics that we can make use of when trying to dodge misinformation. This entry was posted on Thursday, January 10th, 2008 at 5:57 pm	by eiffel	and is filed under Research. You can follow any responses to this entry through the RSS 2.0 feed. Both comments and pings are currently closed.